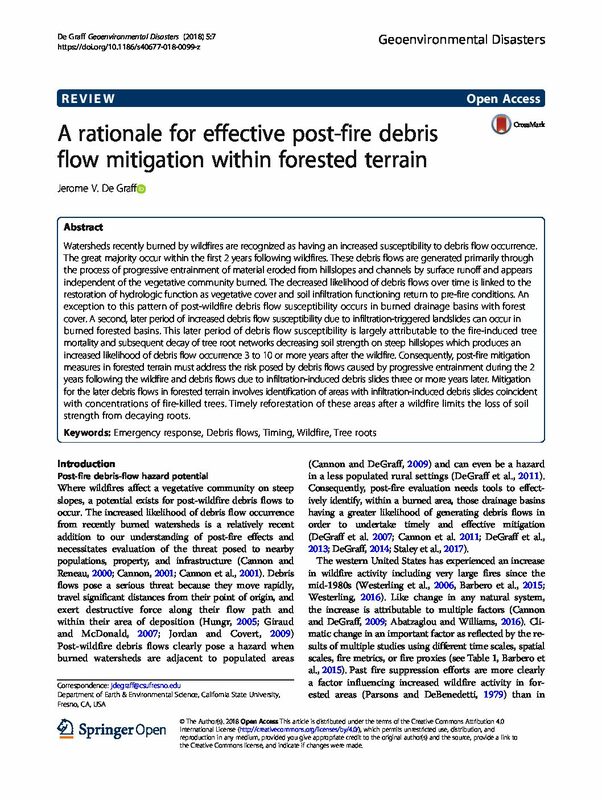 Debris flows generated during rain storms on recently burned areas have destroyed lives and property throughout the Western U.S. Field evidence indicate that unlike landslide-triggered debris flows, these events have no identifiable initiation source and can occur with little or no antecedent moisture. Using rain gage and response data from five fires in Colorado and southern California, we document the rainfall conditions that have triggered post-fire debris flows and develop empirical rainfall intensity–duration thresholds for the occurrence of debris flows and floods following wildfires in these settings. This information can provide guidance for warning systems and planning for emergency response in similar settings. 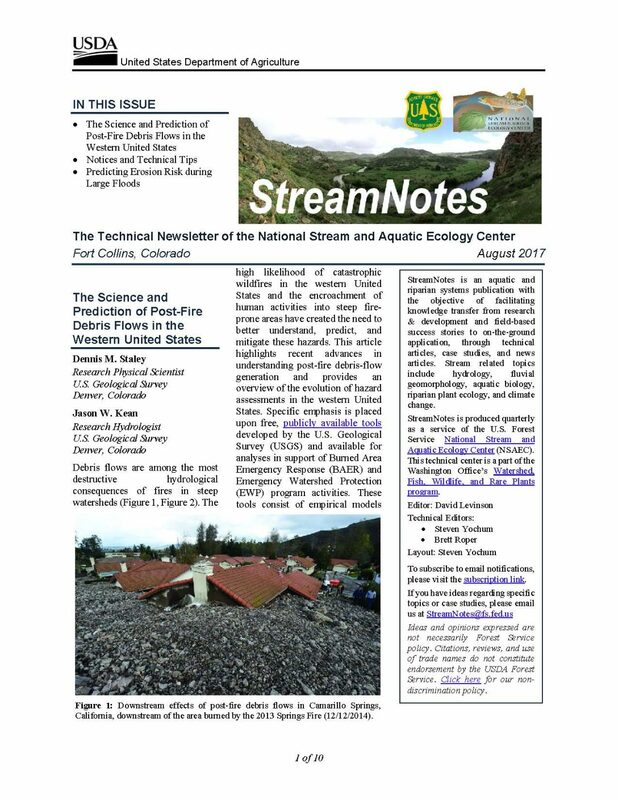 Debris flows were produced from 25 recently burned basins in Colorado in response to 13 short-duration, high-intensity convective storms. Debris flows were triggered after as little as six to 10 min of storm rainfall. About 80% of the storms that generated debris flows lasted less than 3 h, with most of the rain falling in less than 1 h. The storms triggering debris flows ranged in average intensity between 1.0 and 32.0 mm/h, and had recurrence intervals of two years or less. 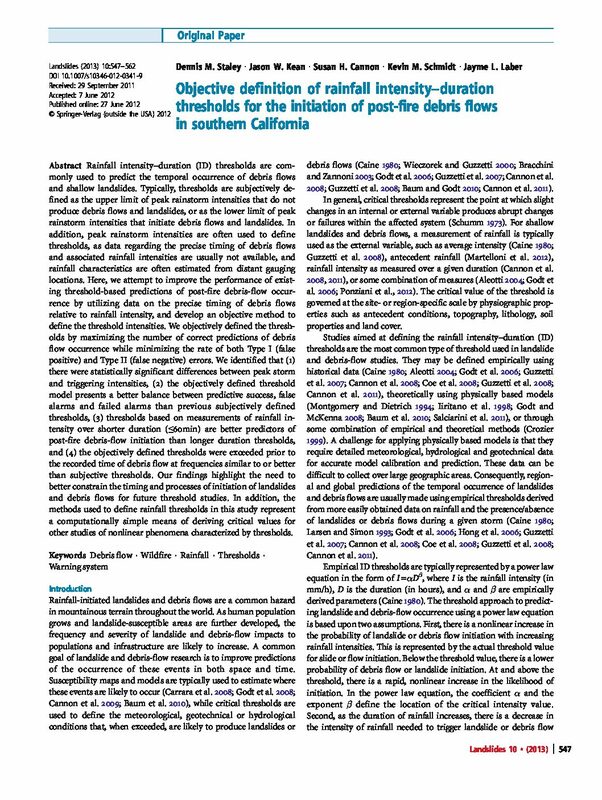 Threshold rainfall conditions for floods and debris flows sufficiently large to pose threats to life and property from recently burned areas in south-central, and southwestern, Colorado are defined by: I = 6.5D− 0.7 and I = 9.5D− 0.7, respectively, where I = rainfall intensity (in mm/h) and D = duration (in hours). 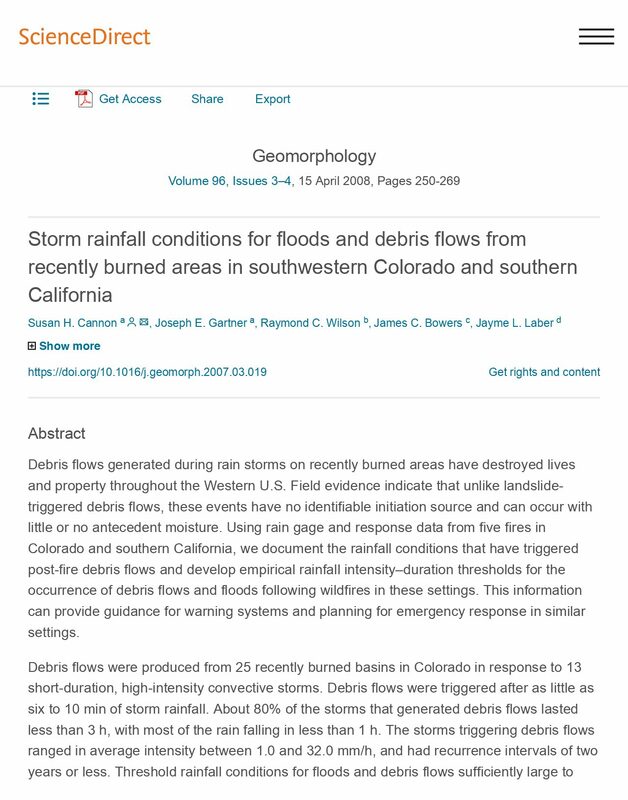 Debris flows were generated from 68 recently burned areas in southern California in response to long-duration frontal storms. The flows occurred after as little as two hours, and up to 16 h, of low-intensity (2–10 mm/h) rainfall. The storms lasted between 5.5 and 33 h, with average intensities between 1.3 and 20.4 mm/h, and had recurrence intervals of two years or less. 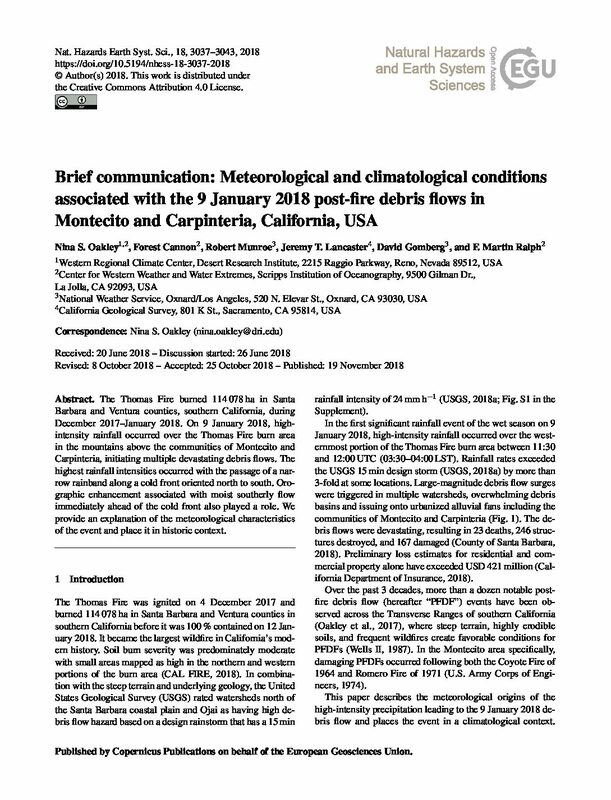 Threshold rainfall conditions for life- and property-threatening floods and debris flows during the first winter season following fires in Ventura County, and in the San Bernardino, San Gabriel and San Jacinto Mountains of southern California are defined by I = 12.5D−0.4, and I = 7.2D−0.4, respectively. 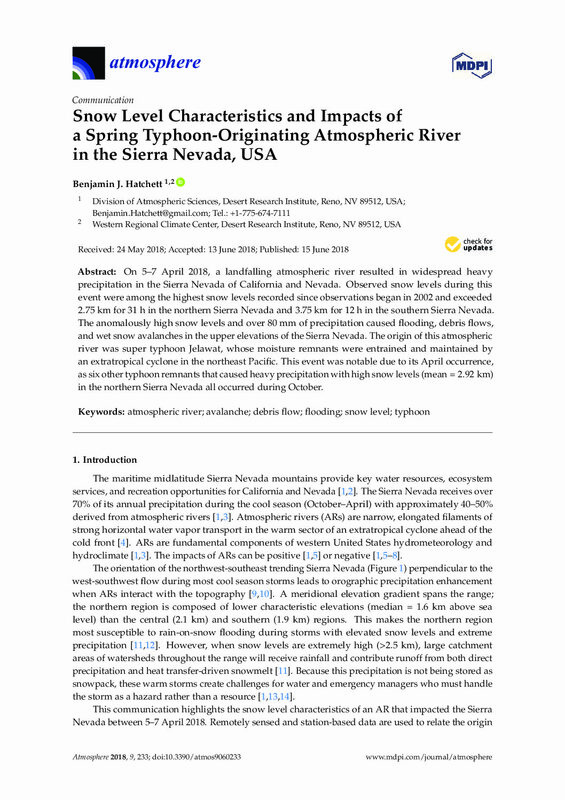 A threshold defined for flood and debris-flow conditions following a year of vegetative recovery and sediment removal for the San Bernardino, San Gabriel and San Jacinto Mountains of I = 14.0D−0.5 is approximately 25 mm/h higher than that developed for the first year following fires. The thresholds defined here are significantly lower than most identified for unburned settings, perhaps because of the difference between extremely rapid, runoff-dominated processes acting in burned areas and longer-term, infiltration-dominated processes on unburned hillslopes. The Transverse Ranges of southern California often experience fire followed by flood. This sequence sometimes causes post-fire debris flows (PFDFs) that threaten life and property situated on alluvial fans. 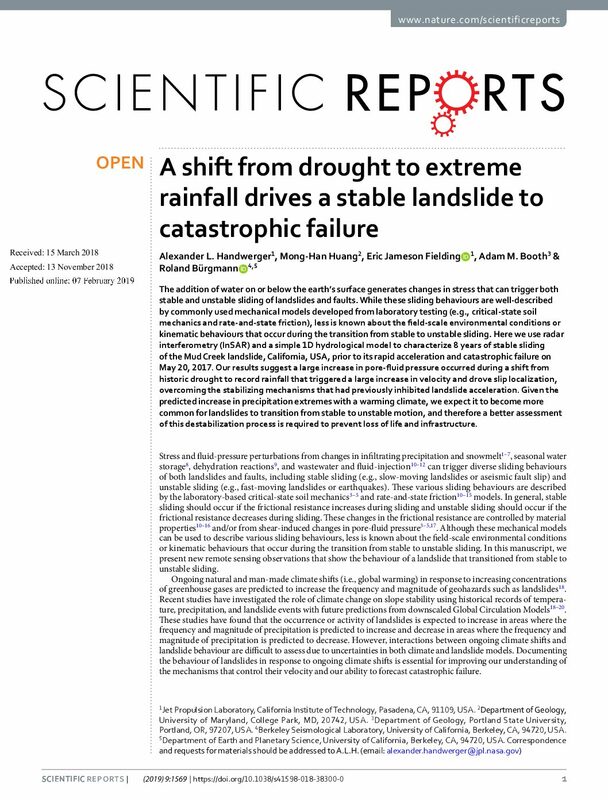 The combination of steep topography, highly erodible rock and soil, and wildfire, coupled with intense rainfall, can initiate PFDFs even in cases of relatively small storm rainfall totals. 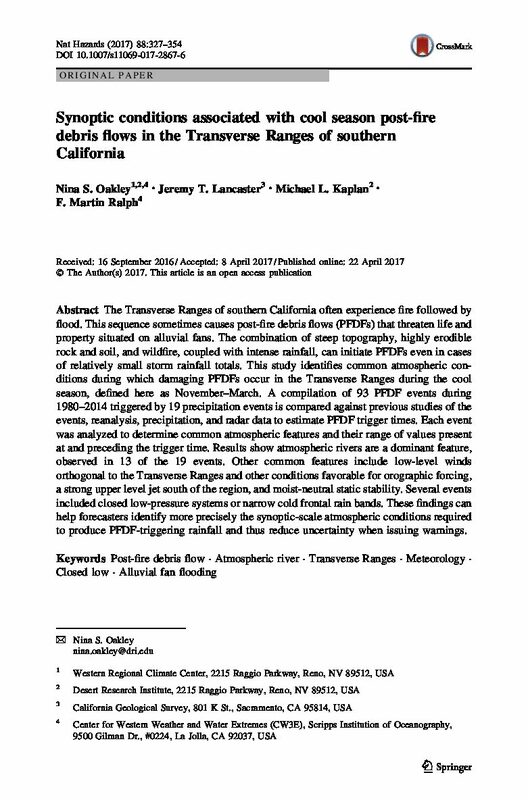 This study identifies common atmospheric conditions during which damaging PFDFs occur in the Transverse Ranges during the cool season, defined here as November–March. A compilation of 93 PFDF events during 1980–2014 triggered by 19 precipitation events is compared against previous studies of the events, reanalysis, precipitation, and radar data to estimate PFDF trigger times. Each event was analyzed to determine common atmospheric features and their range of values present at and preceding the trigger time. Results show atmospheric rivers are a dominant feature, observed in 13 of the 19 events. Other common features include low-level winds orthogonal to the Transverse Ranges and other conditions favorable for orographic forcing, a strong upper level jet south of the region, and moist-neutral static stability. Several events included closed low-pressure systems or narrow cold frontal rain bands. 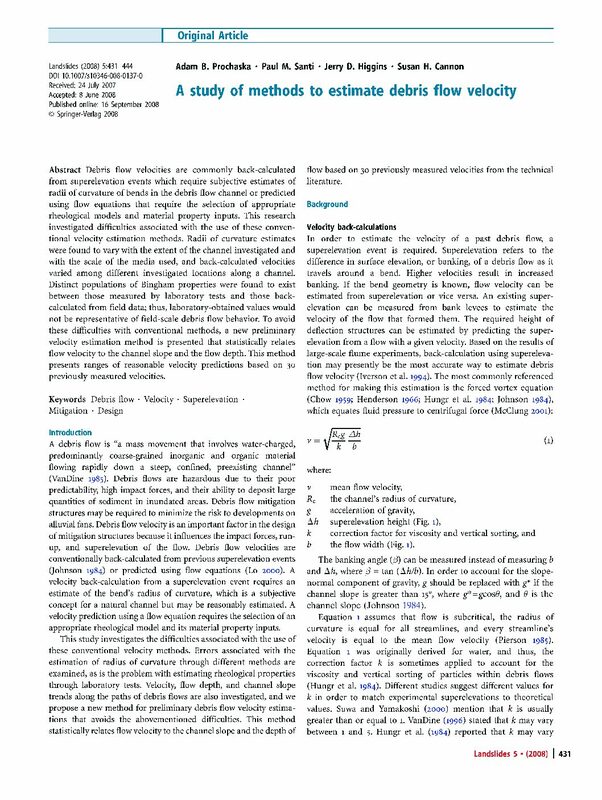 These findings can help forecasters identify more precisely the synoptic-scale atmospheric conditions required to produce PFDF-triggering rainfall and thus reduce uncertainty when issuing warnings.